In 2003 the prior of St.Peters Abbey authorized Palm Breweries to brew Steen Brugge to the original recipe enabling this authentic Belgian beer to be readily available and remain traditional in style. In 1084 Arnold of Tiegem founded St.Peters Abbey. His beers became legend due to their healing powers and he became the Patron Saint of Brewers and Deveney's of Dundrum. In Bruges the character of each beer was determined by a herbal mixture- Gruut, the brewers were obliged to buy this from the city's herbal house known as the Gruuthuse. This tradition is continued by Steen Brugge. 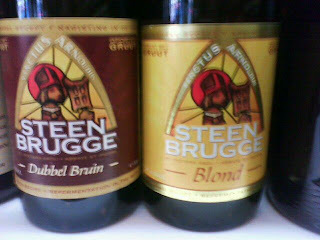 Steen Brugge Blonde is refreshing like the wheat beer but tasty like the Tripel, Warm round with subtle hop aromas and a lovely fruity perfume €2.79 each. Steen Brugge Dubbel Bruin, this is a brown beer with a really full bodied rich flavour, alc content 6.5%. €2.79 each.